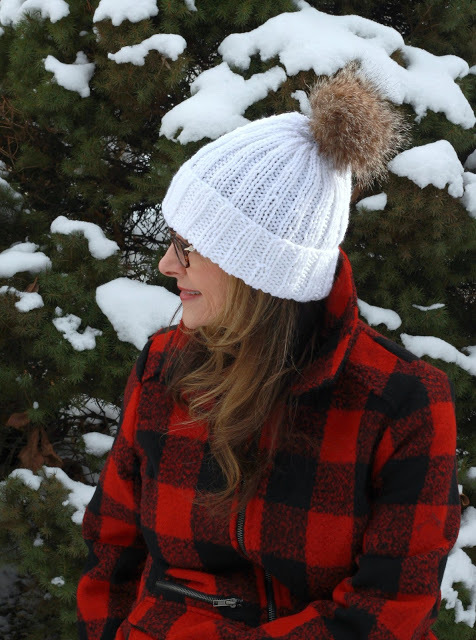 Cold and snowy weather is just beginning in our neck of the woods but I’ll be keeping warm with these quick knitted hats, knit toques and super popular, messy bun hat. 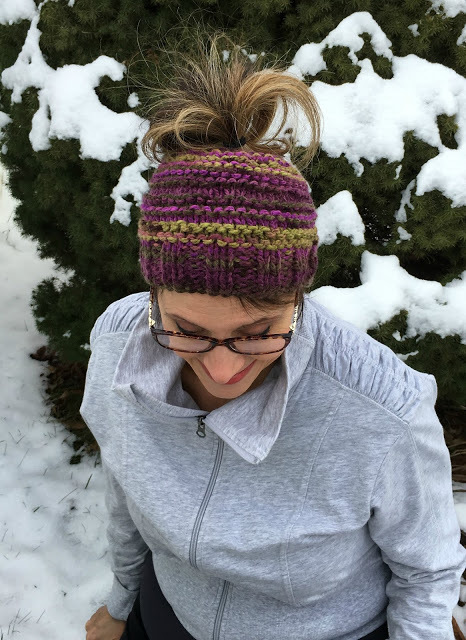 Messy bun hats are everywhere with patterns galore in both crochet and kitted versions. This knitted one is really fun and takes less than a skein of bulky yarn. I started it before going to bed one night and finished it the next morning after breakfast! 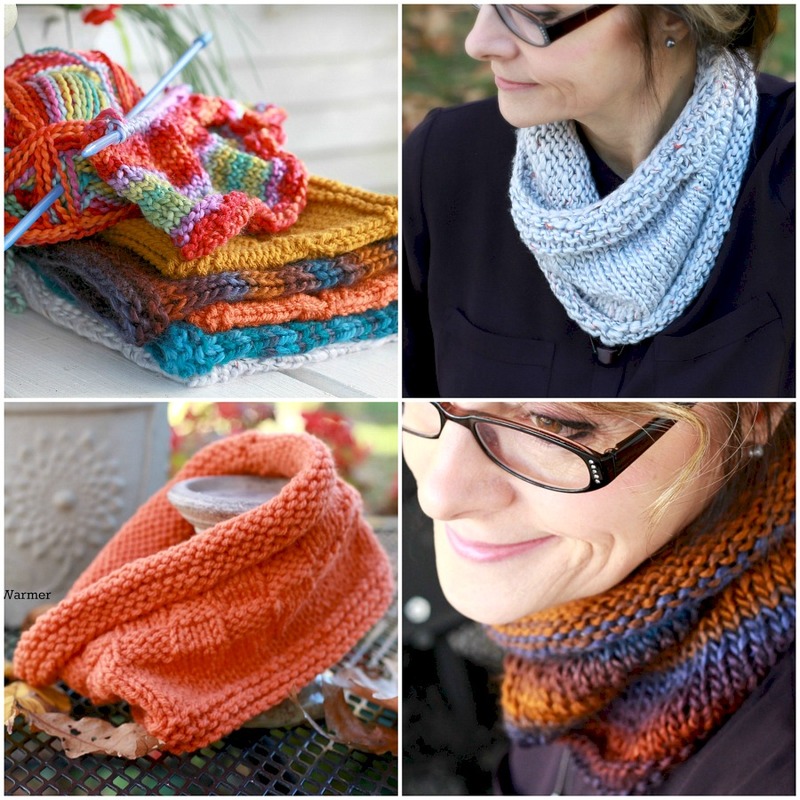 Mine is a slight variation of this free pattern found on Revelry by Isela Phelps. I love this one. It is an easy Knit 2 Purl 2 rib. I made it in both white and this flecked tan. 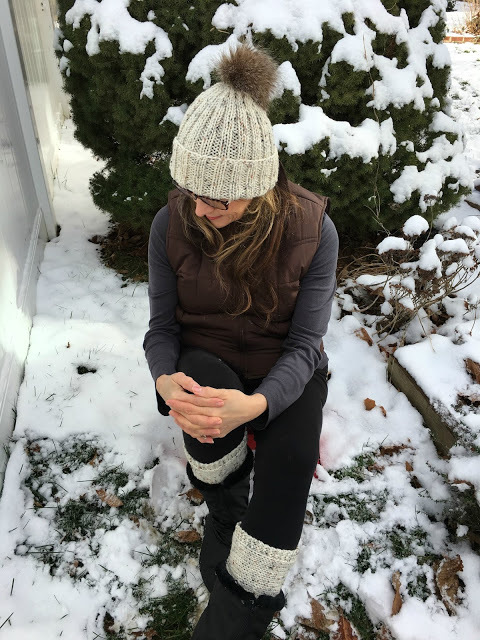 It is called Easy Fit Ribbed Hat by Red Heart. Wear without a pom-pom, add a yarn pom-pom or tie on a faux fur pom-pom. 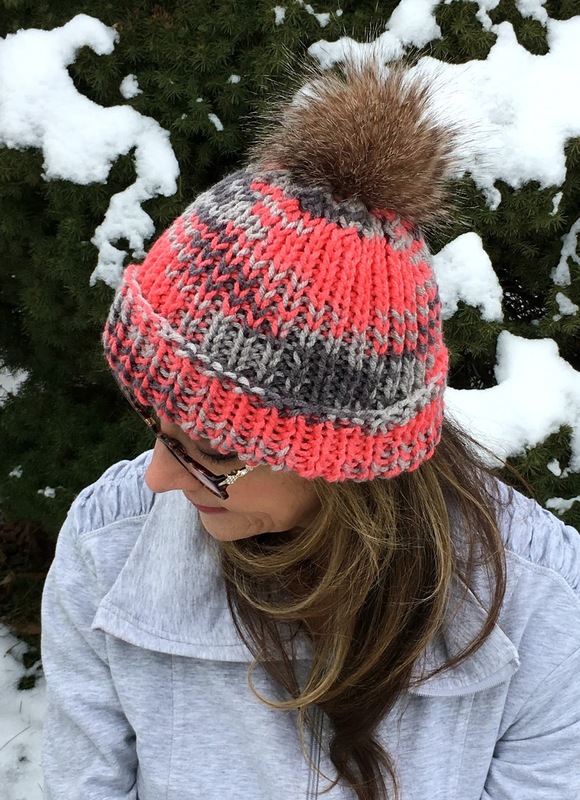 Want to make your own pompom? 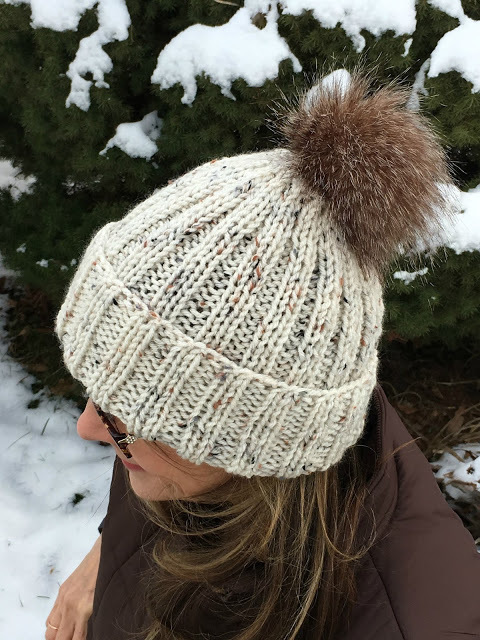 Click Faux Fur PomPom for the easy how-to. This adorable toque is worked in a Knit 1 Purl 1 rib. It couldn’t be easier. 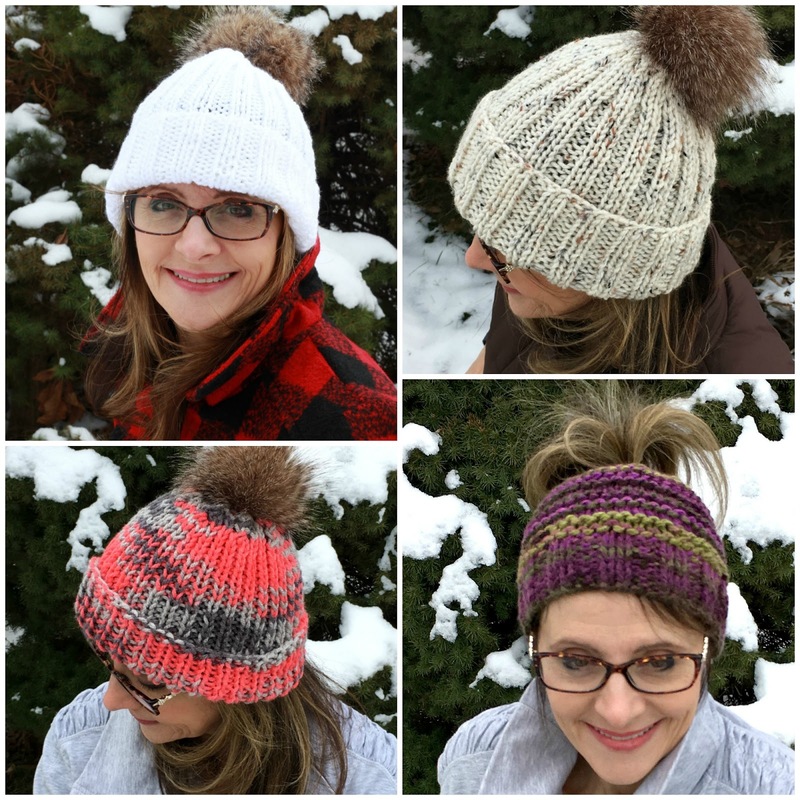 Hope these pics will inspire you to get your knitting needles out to make yourself or someone else a warm and stylish hat this winter. To fit: child size 8-10 years (lady) man. 15 sts and 20 rows = 4″ [10 cm] in stocking st.
will be written thus ( ). Cast on 57 (61-67) sts. 21.5) cm], ending on a 2nd row. (2-1) time(s). 43 (47-51) sts rem. 2nd and alt rows: *P1. K1. Rep from * to last st. P1. 3rd row: *K1. P3tog. K1. P1. Rep from * to last 1 (5-3) st(s). K1. (P1. K1) 0 (2-1) time(s). 29 (33-35) sts rem. 5th row: *K1. P3tog. Rep from * to last 1 (1-3) st(s). K1. (P1. K1) 0 (0-1) time. 15 (17-19) sts rem. end tightly through rem sts. Sew center back seam, reversing 2″ [5 cm] for turn back. LION BRAND Wool-Ease Chunky, LION BRAND Unique, PATONS Shetland Chunky, RED HEART Chunky Soft. I love your hats and can't wait to see the boot cuffs. I don't wear hats like this because I need a brim. I've made many hats in this style for my grandkids and for gifts. I thought about making one, but decided not to make the messy bun hat. I think the snow and weather would make my hair wet, and that's not good when I homestead (and have outdoor work). I do need a new hat, so I may have to make one yet. Its so lovely to see your sweet face in those lovely knits! I cant believe how long its been since I read through a few blogs and how long its been since I even posted on my blog!! about ten months to be exact. But I do love seeing your IG posts and those of your beautiful daughter and her fabulous family! !